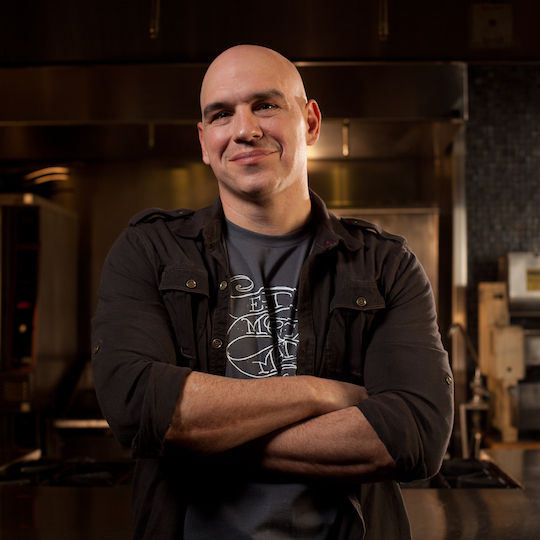 Chef Michael Symon cooks with soul. Growing up in a Greek and Sicilian family, the Cleveland native creates boldly flavored, deeply satisfying dishes at his restaurants: Lola, Mabel’s BBQ, Roast, Bar Symon and B Spot. Most recently, he opened Angeline, an Italian restaurant in Atlantic City named after his mother. Michael also shares his exuberant, approachable cooking style and infectious laugh with viewers as an Iron Chef on the Food Network and as a co-host on ABC’s The Chew. Since being named a Best New Chef by Food & Wine magazine in 1998, Michael and his restaurants have been awarded numerous honors: in 2000 Gourmet magazine chose Lola as one of “America’s Best Restaurants;” in 2010, Michael was the first chef ever to host the annual Farm Aid benefit concert; Bon Appetit magazine included B Spot on their list of “Top 10 Best New Burger Joints;” B Spot’s Fat Doug burger won the People’s Choice award at the SoBe Wine & Food Festival. Michael made his debut on Food Network in 1998 with appearances onSara’s Secretswith Sara Moulton,Ready, Set, CookandFood Nation with Bobby Flay, before being tapped to host over 100 episodes of The Melting Pot. He then went on to win season one of The Next Iron Chef in 2008, earning him a permanent spot on the roster of esteemed Iron Chefs. Throughout 2010, Michael appeared on four Food Network/Cooking Channel shows, hosting Food Feuds and Cook Like an Iron Chef, judging season three of The Next Iron Chef and competing on Iron Chef America. In January 2012, Michael’s show Symon’s Suppers, premiered on Cooking Channel and in September 2011, he joined the cast of The Chew on ABC as one of the show’s five hosts. The Chew, current in its fourth season, has received widespread critical acclaim and has won over the hearts and stomachs of audiences across the US. While Michael shines on television, he is a genuine hometown guy who made his name cooking in his acclaimed restaurants. Lola opened in 1997 and is now a cornerstone of Cleveland’s dining scene. Roast brought Michael’s meat-centric cooking to Detroit’s Westin Book Cadillac in 2008, and after opening the first two Cleveland locations of B Spot in 2009, Michael has expanded with multiple locations throughout Ohio, Michigan and Indiana, showcasing his passion for burgers, bratwurst and beer. Mabel’s BBQ opened in 2016 and introduced a new style of mustard-based barbecue Clevelanders could call their own. In 2017, he opened Angeline at Borgata Hotel Casino & Spa in Atlantic City as a nod to his Sicilian mother, Angel. Michael published his first cookbook, Michael Symon’s Live to Cook – Recipes and Techniques to Rock Your Kitchen, in 2009, sharing home cook-friendly recipes that draw on the flavors of his heritage. Michael’s second cookbook, Carnivore, dedicated to meat lovers, was published in October 2012, his third cookbook, 5 in 5, inspired by a popular speed-cooking segment on The Chew, was published in September 2013 and his latest cookbook, 5 in 5 For Every Season, was published in September 2015. All of Michael’s cookbooks were hugely successful and both Carnivore and 5 in 5 made The New York Times Book Review best sellers list. His latest book, Playing with Fire, hits stands in April 2018. When he’s not working, Michael is riding his motorcycle, cooking at home, playing golf, thinking about his next tattoo, gardening in the backyard and spending time with his wife, Liz, and their Old English bulldog, Ozzy.